"The Class of 1900, was said (at the time) to have been the class with the greatest number of graduates from Wakefield High School. Of the 39 graduates, 21 successfully completed the Classical Course, and 18 completed the English Course. The graduation exercises were held on Thursday evening, June 28th at the Town Hall. The class motto was Pas a Pas (Step by Step), the class song was music from 'Martha', and a disputation 'Resolved that the Navy of the United States Should be Increased' was led by Owen Long Burdett (affirmative) and William Barron Rogers (negative). The salutatory and essay 'Is Higher Education of Advantage to Women?' was presented by Mary Gertrude Hickey, with the essays and valedictory, 'The Golden Age' presented by Anna Carter Mansfield. In the 1900 Town Report, School Superintendent U.G. Wheeler said: 'The high school occupies a more advanced position then ever before. The graduate of the school to-day (sic) has a better education than the college graduate of less than 100 years ago, and in our town it stands, as it should, at the head of our school system the goal of which the pupils of the lower grades are working and the number belonging to the high school shows that a good proportion of them attain their object and avail themselves of its privileges.'" -- Text from calendar by Jayne M. D'Onofrio. 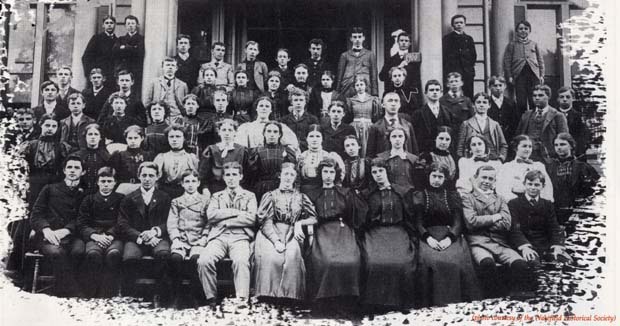 “Wakefield High School students, 1900,” NOBLE Digital Heritage, accessed April 20, 2019, https://digitalheritage.noblenet.org/noble/items/show/7134.